My good friend Dianne is visiting again today from Mexico. 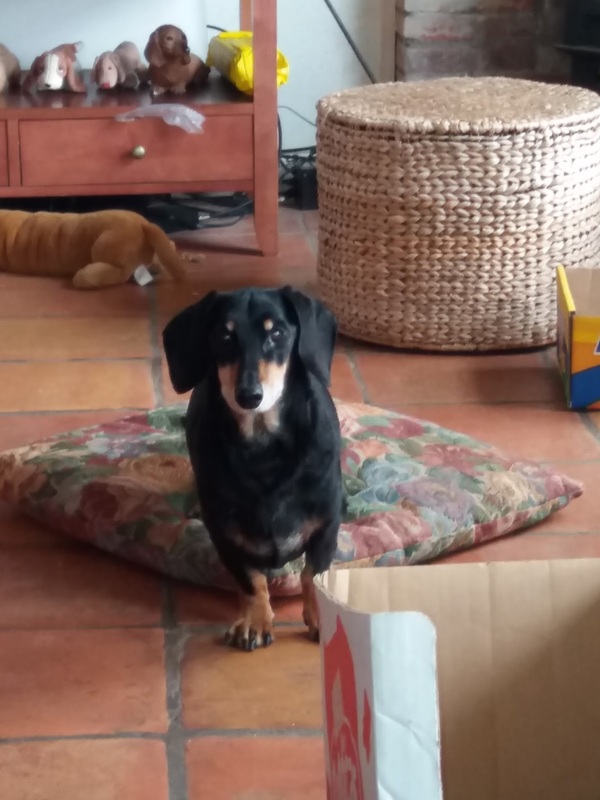 Today she has is sharing the story of her wonderful 14 year old dachshund, Miguel Luis. 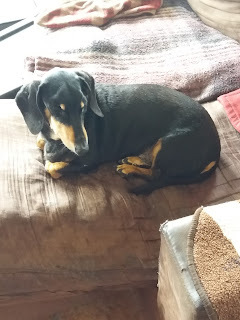 I have known Miguel for years online through a dachshund group, and I think you will enjoy getting to know him better here today too. 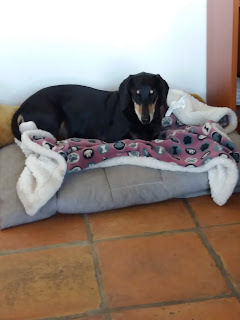 Dianne has visited before, to remember her dachshund Lili Marie and to share the story of Miguel and Lili's life together. 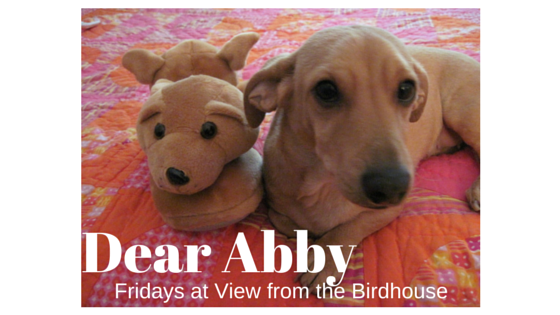 Abby: Thanks for stopping by! 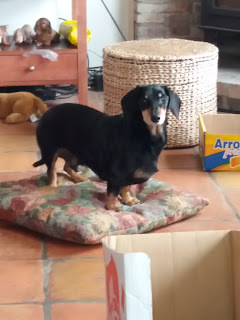 What pet would you like to introduce at my blog today? Abby: What are some happy memories of Miguel? Dianne: One evening we were having an incredible sunset so I grabbed my camera and walked outside to get a picture, not knowing that he walked out behind me. I took my picture, went inside and locked the door. About ½ hour later, I realized I hadn’t seen him in awhile and it finally occurred to me that he may have followed me out. I opened the door and there he was, sitting right in front of the door, waiting for his dumb mama to come for him. Abby: I enjoyed visiting with you today. Is there anything else about Miguel Luis you would like to share? Dianne: Miguel’s 14 years old and I know he won’t be with me forever so I’m treasuring the time I get to have this great guy around. Abby: Dianne, thank you so much for visiting! I'm so glad you have Miguel, and I am delighted to know him too. I love it that he is bilingual! And I'm so glad he followed you home after you went out to photograph the sunset! Friends, you can leave comments for Dianne and Miguel in the comment section below. If you want to feature a beloved pet here, please let me know with your email. Thanks! Miguel is such a cute dog. I enjoyed hearing more about him today. Miguel is the cutest! Our apartment complex won't allow for pets, but if it did, I'd want a puppy just like Miguel! So cute! Miguel reminds me of the dog Buddy from the movie The Secret Life of Pets! Adorable little guy. I can't wait to get a dog when my kids are older. These posts are becoming some of my favs. They are always so fun to readand lov hearing about the special pets! We have an aunt with a Dachshund dog that looks almost identical! They're such a great breed. politely sitting and waiting. LOL She is just like mine always were. You haven't lived until you have a 6 pack of dachshunds to keep up with. there she would be warm as toast. that back issue. Give Miguel and Baby a big hug from Aunt Jean..
What a cute dog. 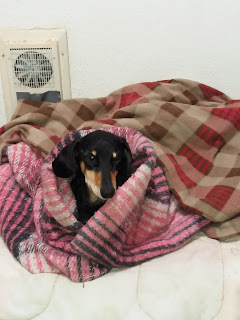 We have a rescue dog that we adopted years ago and he is very energetic. 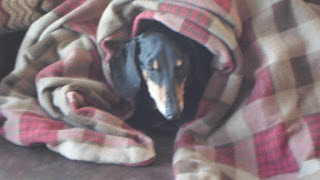 I didn't know that much about Dachshunds previously. Thanks again, Dianne, for visiting! I loved hearing more Miguel stories. Jean, I agree - Miguel is such a good boy! Thank you friends for stopping by. I had no idea dogs could be bilingual. They are such smart animals. He is a cutie too! 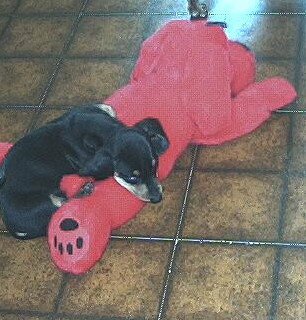 I miss having dogs. I have 2 cats right now but they aren't as active as when I had my cocker spaniels and rat terriers.